"The number of casualties will be more than most of us can bear." Title: "A Nation In Mourning"
Quilt Description: A memorial quilt dedicated to those who died 9-11-2001 in the World Trade Center attack featuring: 50 candles; one for each of the United States, shreds of fabric along the bottom edge represent the rubble, fire department helmet, NYC police badge, and EMT symbol represent those courageous people who gave their lives to help those in need. 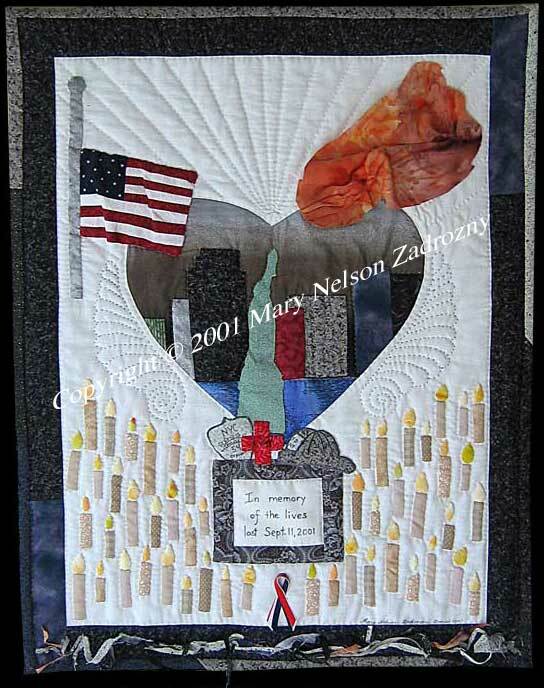 The flag at half staff, the heart shape because our hearts went out to the people of New York City, the feather quilt design near the heart represents angel wings and was quilted with black thread, a color of mourning. The smoke fabric was attached with raw edges exposed because our emotions were raw. The back of the quilt lists only a very small percentage of the victims because there were so many, however I tried to choose a cross section representing all ages, all occupations. FDNY Chaplain Mychal Judge was listed first because his story touched me deeply. It took me several days to go through the victim lists, although I personally knew none of them, I could only read the lists for short periods of time before I broke down. They were not just names on a page to me, but people who left behind families and friends...people whose lives were cut short needlessly in an act of unimaginable violence. Working on this quilt helped me process some of the emotions I was feeling; profound confusion, grief and shock. "May God bless all the victims of this tragedy and their families. Our hearts are broken but our spirit is not." Materials: Cotton fabrics, polyester batting. Embellished with ribbon. Techniques: Machine Pieced, Needle Turn Applique, Fusible Applique, Hand-Quilted.